Fletcherize is one of those words that might make you hate dictionaries. If you look it up in the OED, you'll see the literal meaning ("to masticate thoroughly") followed by the note "also fig." Also figurative. And that's extremely unhelpful if you can't connect the dots between literally fletcherizing something and figuratively fletcherizing something. But don't worry, connecting the dots is what these emails are for. We might encounter the same frustration with ossify (how does something figuratively ossify? ), tamp (how do you figuratively tamp something? ), and varnish (how do you figuratively varnish something?). If you're not sure how to use those words figuratively, follow the links, and I'll help you connect those dots. Let's go back to Horace Fletcher and his enthusiasm for healthy eating. His name gave us the word fletcherize, of course. Could you describe the people whose names gave us the words maudlin and martinet? To fletcherize food is to chew it for so long that it turns into liquid. More generally, to fletcherize something is to read it over and over, to think about it over and over, or to talk or write about it over and over, until it's been processed so much that it can't possibly be processed any further. The word "fletcherize" is ugly, clunky, and unusual, but it's totally perfect for describing how useless and extreme our behavior is when, like a dog with a bone, we just can't let something go. Talk about people fletcherizing books and articles, ideas and topics, plans and possibilities, wishes and memories, etc. Ninth graders probably hate To Kill a Mockingbird by now. We should stop making them fletcherize it. On the first day of statistics class, as I skimmed the syllabus and saw how few topics we'd be covering, I realized it wasn't necessary to have fletcherized the textbook like I did. Look away from the screen to explain the definition in your own words. You’ll know you understand what "fletcherize" means when you can explain it without saying "chew the cud" or "beat a dead horse." Fill in the blank: "Regarding _____, I've chewed it over; in fact, I've fletcherized it." Example: "Regarding the plot holes in A Year Without a Santa Claus, we've chewed them over; in fact, we've fletcherized them." 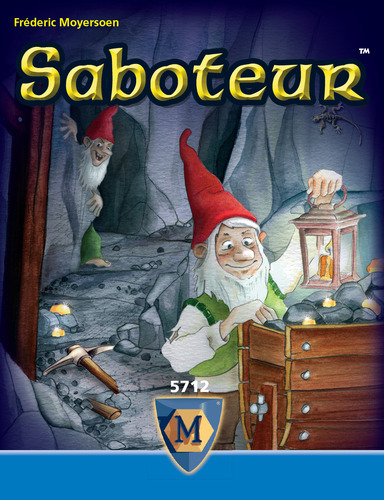 Answer: Saboteur. Check out the game here and the word here. 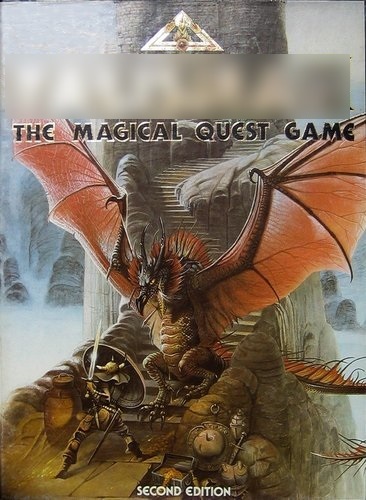 Designed by Robert Harris, this game takes place in a fantasy world where players work to build their strength, hoping to endure the trials that will conclude the game. The title means "anything that protects you or brings you good luck." It's pictured below, with the title blurred out. What game is this? 2. We risk warping a memory every time we recall it. I've fletcherized the memories of our first summer together--they're probably _____.